The Pimsleur® Method: the easiest, fastest way to learn a new language. Completely portable, easily downloadable, and lots of fun. You’ll be speaking and understanding in no time flat! Greek Phase 1, Units 1-5 build on material taught in prior units. Each lesson provides 30 minutes of spoken language practice, with an introductory conversation, and new vocabulary and structures. Detailed instructions enable you to understand and participate in the conversation. Each lesson contains practice for vocabulary introduced in previous lessons. The emphasis is on pronunciation and comprehension, and on learning to speak Greek. This audio book is great for practicing vocabulary and pronunciation but doesn't entirely replace language lessons. Absolutely, Pimsleur Greek is an excellent language learning tool, applicable to anyone willing to learn. I like how there are native speakers and relevant conversations. Good, but could be great! It is good. However, it would be nice if the speaker could state whether (in English) certain words, phrases or syllables are synonymous with the English 'V' or 'th'. E.g is it Amerikaniva or Amerikanitha? It is e-ovos or e-othos? It makes a massive difference! Further, the difference in pronunciation by the female and male speaker sometimes assists one in being able to compare it with a syllable you know, though at other times it is actually the root of the confusion. Lastly, I feel the jump in Chapter 5 was a bit extreme. 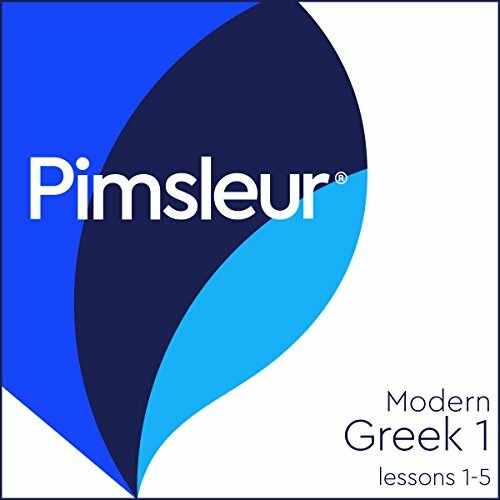 Notwithstanding the above, I am certain that (I can) and I definitely plan to finish learning Greek (entire series) with Pimsleur! Excellent and very effective introduction. The slow syllable-by-syllable pronunciation is extremely effective, as is the graded progression and the structure whereby each lesson built on and reinforces previous lessons. What is the best audio tools for learning a new language I have ever used. However, it is audio only and I find it useful to supplement the audio instruction with written exercises, flashcards, etc. This is a great introduction. You'll listen to it a few times. Wish there was a bit more content for the price.